The push is on to take the heat off the Washington Post and their slavish subservience to GOP talking points in the Jack Abramoff matter by placing the blame on their unruly readers. 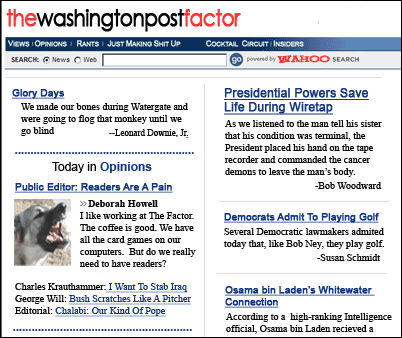 Last Sunday ombudsman Deborah Howell made a statement that is patently, demonstrably false, even according to the Post's own reporting -- contrary to what Howell claims, Jack Abramoff gave no money to Democrats. Period. Somehow the fact that readers might be a smidge upset about this -- a sentiment they have expressed in legion on the post.blog -- seems to mystify the Post, who are now attempting to shift the focus to these "barbarians at the gates" to obscure the fact that now, six days later and in the face of all evidence to the contrary, the situation has escalated from bad reporting to a deliberate attempt to stand in defense of an outright fabrication. It is sad that a group of very mean-spirited readers can not engage in thoughtful, mature and provocative dialogue about stories and controversies. Instead, they revert to cowardly personal attacks on people without the courage to attach their names. As a reporter, I am a staunch supporter of free speech and welcome criticism. But readers should keep their comments to the issues and not make personal attacks that add nothing but empty anger to the debate. Publish partisan lies and not expect a backlash? Get real pal!!! Fire that f***ing b**** forthwith and all's well that ends well, no? Otherwise, batten down the hatches, pal, 'cause there's a storm a brewin' and it's gonna be nasty. You were reading the ones that were posted live. There were a few hundred others that were removed the site altogether, and those would not be on the page you're looking at. The Post could employ some automatic filters to weed out some of the worst offenders, and thus it seems hard to believe their claim that it was requiring two full-time moderators to keep out the blog comments that violated their standards. Either those were some pretty heavy standards that made context such an issue that automated filtering was ineffective, or their web guys are pretty inept. [T]here was no question that the comments, the vast majority of comments were not uncivil or needed moderation. Frankly, I got nastier comments for insulting Chicago-style hot dogs and had a raging debate over mac and cheese which would have curled Brady's hair. [T]his whole situation is really reminiscent of the 2004 Adam Nagourney incident. Rough version: Nagourney wrote an article which passed on Bush administration peddled horses**t about how after the handover to the transitional government in Iraq U.S. casualties had declined. But they didn't. No matter how one squinted at the data, casualties hadn't declined. There was no way to slice it and dice it to make it so. Many angry exchanges between people and Nagourney and the useless Okrent. Many denials from them. Finally half-assed correction and an Okrent column which revealed the name and hometown of a rather "uncivil" reader because of his dastardly incivility. I suppose telling the truth is an impossibly high standard to expect from journalists, but it's somewhat surprising that the Post doesn't even aspire to it. Meanwhile, flaming the friends of transparency isn't helping anyone. Get it, Jane? What I get is that listening to Brady and Rosen discuss the management of a large public board is like listening to two white, middle-aged Exxon executives discuss "what's really wrong with the negroes." As if this was some huge, unforseeable problem. Anyone who sets up a public board like this in a highly partisan world with really active readers and doesn't make plans for troll management in their system architecture is a full-on, four-flushing idiot. If you do have a problem (and I maintain it is nothing that considering the number of comments involved couldn't be handled in five minutes hovering over a delete key, we do it every day) it is utterly disingenuous to lay off blame for your own shortcomings by blackening the readership. And given the fact that everyone at the WaPo now seems to be toeing this line, I do not think I am overboard in suggesting that this is part of some larger management decision that refuses to take responsibility for a very big problem. Let's get this straight. The Right hates honest journalism. Has run a 35 year campaign against it. Hugh Hewitt does almost nothing but blast regularly what he considers to be "the liberal media" which, of course, includes the Washington Post. All we, on the left, wanted was a straightforward correction and admission of error and a genuine attempt to correct the record. Good one, Jim. As the guy tasked with setting up an internet presence for the Post, igniting a land war with two of the biggest names in the blogosphere was a really shrewd move. This attempt to "blame the trolls" and shift the dialog over onto a remedial internet issue that people like Kos, Atrios, Digby, MyDD, Crooks & Liars and other deal with quite seamlessly every day of the week is absurd. It is a cheap excuse to divert the focus from the real problem -- Deborah Howell screwed up. She said something that was blatantly untrue. People are justifiably angry and to let them hijack the dialog over to "impolite commentary" is an attempt to get themselves off the hook. And it won't work.